Anyone who knows me knows I love all things pie, so I’m always curious what people’s favourite pie flavours are. Lunchtime discussions with Lisa, our lab manager, determined hers to be raspberry, which (for some strange reason) I’d never tried. I can’t say I’d ever even heard of raspberry pie, as it seems to play second fiddle to the more famous strawberry rhubarb, blueberry or blackberry pies. Intrigued, I decided to give it a try. Preheat oven to 425 F. Carefully mix together raspberries, sugar, tapioca, cornstarch, lemon juice, cinnamon and salt until well-combined. 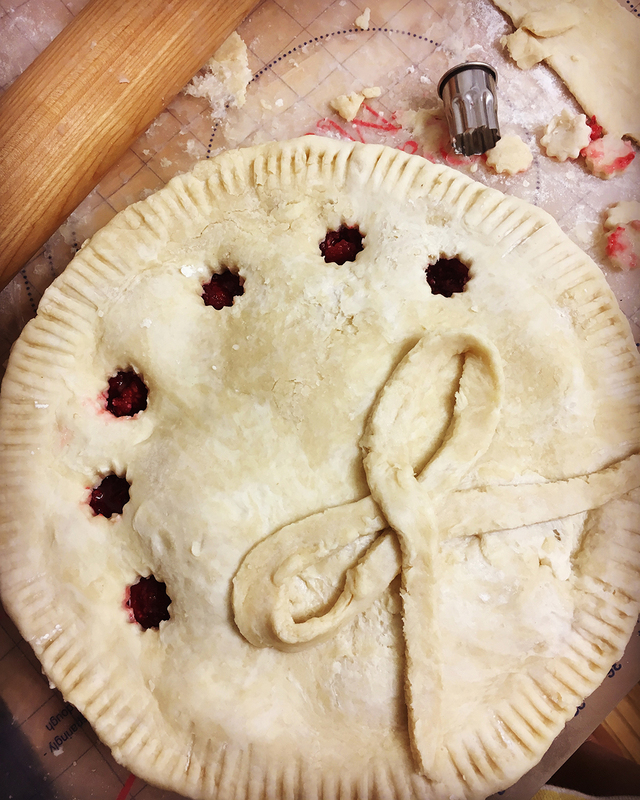 Pour into 9″ pastry shell; add top crust and crimp edge. Bake in preheated oven for 15 minutes. Reduce heat to 375 and bake until crust is golden and filling is bubbly, about 40 minutes. Allow pie to cool completely before serving. As I was bringing it into the lab to share, I didn’t sample it after it finished baking. It did however smell delicious while in the oven (a raspberry jam-like aroma wafting through my apartment). I was pleasantly surprised with the results–not too sweet, but in fact a little tart. I’m always worried about pie fillings turning out too runny, but this set up beautifully. It seemed to go over well with my labmates, as I returned home with an empty pie plate. I will definitely have to make it again, if only to get to eat more than one piece!